What do Judy Blume, Elliott Gould, Alan Dershowitz and I have in common? We all turn 80 this year—in my case, on January 22. I read about your 80th birthday on January 22. It attracted me because my granddaughter’s birthday is that day also. Liliana is 23 and lives in Iowa City. Now, let’s go back to E. Meadow around 1970ish. We were so young (I turn 80 in August) and you came along to help us get a Hadassah group started. I remember a meeting in my house on Cleveland Ave. Well, the meeting was very successful and we had, and still have an active group in that town. Of course, I am a life member along with all my family members. We have lived in Boynton Beach for 20 years, and I am very active in our local group started by Simi Rosenberg. You know her I am sure. Marlene—this is just a stream of consciousness letter because remembering you has made me remember our lives so many years ago. All the young mothers with little kids, forming this group and working so hard together in a close community. I was education chairman along with Barbara Singer for endless years. Our programs were priceless, so inventive and worthwhile. Tomorrow I am meeting with Betty Melnick to plan the program for our E. Meadow luncheon on Feb. 13. Around 35 women usually show up every year for the get together because we stayed in touch and remained friends. Mostly that was due to our belonging to Hadassah. My husband Artie and I have been to Israel 6 times and love our precious country. You, Marlene had a lot to do with all the above. I hope you are well and happy. 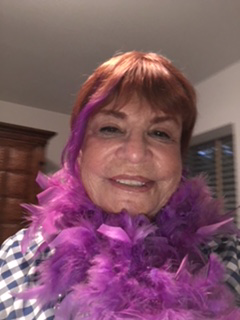 For my 80th birthday, September 20, 2017 (of all days it was Yom kippur), I dyed a portion of my hair purple and wore a purple boa. I was always known as Ms. Energetic, working full-time, raising three children, tennis, bridge, and later golf. Many of my friends and acquaintances told me I looked young for being 80 years of age. My answer to them is always that I took a lot of care to look this way, but my body knew and knows that I am 80 years old. So…that’s how I feel about being 80. Wish I were younger, but happy to still be here. I will be celebrating my 80th on February 11. Although my kids made me a pre-birthday surprise party over this past Thanksgiving (no one will be available to come to Florida in February) I never thought about it being a milestone. I’m grateful that my husband, who turns 81 also in February, will share with me. I feel nervous about the years and can’t imagine how we got to be so old and yet, feel so young. Our children think we can do anything and push us to do more but I am content with our easy going lifestyle. We are going to celebrate the date with having friends from NYC. She is my friend since we were 11 years old and she married my husband’s best friend since they were 5. Need I say how close we are. We are so thankful. Anyway, appreciate the milestone hint because I have much to think about and enjoy. Happy birthday to you, too! January 22 especially…you share the date with my granddaughter who turned 18! I turn 80 on January 24, 2018, so you are two days older than I am. It is exciting to reach this milestone and am thankful to be in good health both mentally and physically. I lost my husband 25 years ago and persevered to have a long and happy life doing whatever I could to make this happen. I made many new friends and kept the ones I had and continued to have and active life. I became the president of my Hadassah chapter for several years and became an active part of the Region after that. I went to all the conventions and Hadassah gave me a new life. In fact, when I moved to my new Active Adult Community 10 years ago, one of the reasons I moved here was because there was an active Hadassah chapter and I knew I could make new friends and fit right in, and it was the best thing I could have done. I have been C0-VP of Fundraising for Bat Shalom chapter in a very active chapter for many years. Moving to this community is the best decision I ever made with all it offers. My life has been good and I make sure I enjoy every minute of it. And now this big birthday! I will persevere to make the next big one! My biggest celebration of this birthday was in October 2017 when I went on a wonderful 2 week Mediterranean cruise in Europe with a friend, which was a gift I purchased for myself for this 80th birthday. We had a fabulous time and enjoyed Europe after not being there for many years. Today, I will be celebrating at the restaurant in our clubhouse as some of my friends are taking me out for this birthday. In a few weeks, when all my friends from my old neighborhood are back in New Jersey they are taking me out for another celebration. Celebrations are good!! 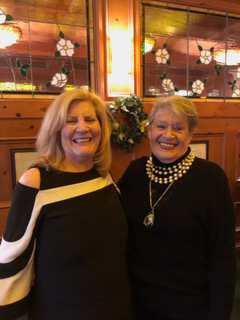 You and I crossed paths when you first became national president and I was a co-chair of Myrtle Wreath for the Southern New Jersey Region. You were our keynote speaker and we had standing room only. I was also at the convention when you were installed as national president and joined in the festivities with your region as one of my friend’s daughters was a member of your region. I knew that Alan Dershowitz was turning 80 this year since he was in my class at Brooklyn College. I also share a name with you as my maiden name is Post. WOW! Turning 80 is a big deal in my life! I never expected to live so long being that my mother and her family all passed in their early sixties. This is a big deal for me! Being alive and able to be with my family to watch them grow and prosper means so much to me. Being that I had a big party for my 75th we are not doing parties anymore. We will probably just have a family dinner in a lovely restaurant and that’ll make me very happy just being together. The icing on the cake will be if my grandson who is in college in Boston, can come down to help celebrate. I think my other grandson who works in NYC will be able to join us which is so great! We take things more slowly these days and appreciate the good times! Happy Birthday to you again my dear friend and colleague! You have been an inspiration to me for many years. My Hadassah Magazine just came today and my 80th birthday is tomorrow. Hard for me to believe. I’m glad to see I’m in such good company. I am having a party tomorrow for family and a few good (old) friends. It’s a family project: I ordered the food, my husband is taking care of the drinks, one daughter is getting the cake (Blum’s famous coffee crunch cake, a San Francisco tradition) and my other daughter is taking care of all the party supplies. I feel blessed, especially since I’ve lost so many friends and family members. I turned 80 on February 4. I am still healthy and active and feel blessed to look and feel great! I’m also lucky to be happily married for 54 years. On my birthday, I plan to be skiing at Alta in Utah where I get a ski pass for free as an 80 year old. Turning 80 is a significant milestone, a little scary but all things being equal I look forward to many more years. I, too, have just turned 80, on January 2. Decided to celebrate this milestone on my Hebrew birthdate: 29th of Tevet, reading Torah on January 20, 2018. I read from Bo, Exodus 12:21-24, and 12:25-28. What made this Shabbat more memorable was the fact that Bo was my daughter’s Torah portion for her bat mitzvah on January 10, 1976. Her date had been changed from March to January since the rabbi was going to be in Israel. My granddaughter was born on January 10, 21 years ago. All good things happen in January. My daughter and her family—Sharon and Jim Carlin, Sean, Ryan, Rebecca and myself were with you on a most memorable mission in June 2004. Mazel tov to you and yours. I also will be celebrating this milestone, in July, and am grateful for every day, because it will be 21 as a breast cancer survivor. As to how I will celebrate; just to be together with my husband, my four children and 12 grandchildren will be the best. I wanted to tell you about a mutual friend who celebrated her birthday on February 8th. That would be Gail Poll. Years ago, she told me that you studied nursing together. I kept thinking about my aunts as I approached my 80th birthday last year. Do I love what I enjoy any less because of a number?! My wonderful friends hired a limo and took me to Chicago to a comedy show. I live an hour south of Chicago, in Indiana. We had a wonderful time, filled with laughter and celebration! Every day is special when we have the love of friends and family and of course,good health. Enjoy each day! I will also be 80 this year—my birthday is March 20. I am a lifetime member of Hadassah and we belong to Congregation B’nai Israel, a conservative synagogue in Tustin, California. I would love to hear how many people responded to your request. Happy Birthday and many more. For starters, I feel like my 20-year-old-self inside. The outside is another story. My birthday is on 9/11, which has changed the happiness of each birthday since the tragedies of 2001. I didn’t celebrate for the three years following the attack, as I was too sad for all the people affected by this horrific tragedy. I used to wake up on each birthday before this so happy and anticipating the chocolate cake my family always provided; I am a chocoholic. My wonderful husband and children understood my deep sadness, but pointed out how lucky I was to be alive and be able to celebrate. So, that’s what I do. It’s still not the complete joy I used to feel, but am grateful to have each year. It seems incredulous that I will be 80. I am lucky to enjoy good health and be able able to be physically and mentally active. I hope to have a nice dinner out with my immediate family. That’s all I want; a joyous evening together. And, it so happens that I celebrated my 91st birthday on January 14, am a past president of sisterhood and am still active. I edit our temple newsletter, The Flame, and chair a group of volunteers who help in the office. Almost all of our past presidents are still active in the congregation, on sisterhood’s board and our local Jewish Federation. Yes, I hit the eighties, and yet in my heart of hearts I am 42. For me, hitting 50 was so traumatic it took me until 51 to accept it. Maybe I use the word hitting because I would like to hit it away from me. Sixty wasn’t too bad, 70 was ok. I would not have minded staying there a little longer. Now to the eighties. Yes, I love it and no I don’t. I love it because I am in good health, I love it because I am busy living. Did life turn out the way I expected it to? No, it didn’t. It did turn out, however, like it was supposed to. What I don’t like is that I am not ready to leave life yet. Check below. I am the one on the right, the one wearing pearls. Yes, I had the party. I am not ashamed of my age. Love that people think I look much younger. I am also an author of two books. So yes 80 works just fine. Believe in yourself. I am still trying to digest the fact that I am now 80, as of January 15. When I say the number it becomes an “out of body” experience! Our family plans to celebrate 2018 as a monumental year: my 80th and my husband turns 85! And we are celebrating 60 years of marriage. We are planning a long weekend with children and grandchildren on Kiawah Island. Ten years ago, we celebrated in Israel. Good luck to you. Hope you had a wonderful birthday on January 22nd! I’m happy to see I am in such good company this year turning 80, on March 9. This one really hurts, maybe because even though I am in good health and very active, I worry about this big jump. My parents passed away in their middle eighties, but all their siblings were in their nineties, so I am hoping for a long life. I will be celebrating at a dinner with a group of friends as we do for all our birthdays, but I don’t know yet how I will celebrate my birthday with my children and grandchildren, some away at college, a few living a distance away. How fortunate I am. I will celebrate my birthday with my twin brother. We both lost our spouses but have continued on with our lives. We have seen so many changes in the world and adjusted to them. We have both visited Israel a number of times. The special visit we both had together included our grandchildren. May Hadassah continue to grow, heal and teach. My wife and I have been traveling quite a bit. On our recent arrival home, I came across your “Personal Milestones” column in Hadassah Magazine. I, too, will be celebrating my 80th, having been born in Jewish Hospital (that was the name in 1938) in Philadelphia, Pa. My birthday is September 17th. As a night club comedian, band leader and entertainer, mine was an exciting time in the late 1940s and 1950s. Having married when I was 21, my wife and I will celebrate our 59th anniversary in November. My background includes many years of speechmaking for the ADL, having become the CEO of the Pilot Pen Company for the 34 years leading up to my retirement, and so much more. There is a book called “Pilot Your Life” that I wrote, that was published by Prentice Hall. I never dreamed that I would reach the age of 80! But here I am. It’s exciting, and I’m having fun. I turned 80 on January 26th, sharing the date with the late Paul Newman. As I reflect on my 80 years of life, I must first thank all my grandparents for making the difficult voyage from Poland, Paris and Belarus that allowed me to be born an American. Remember the “ice man” who brought ice for the neighborhood ice boxes? All the kids would trail behind him hoping to get some ice shards to enjoy on a hot summer day. I felt a bit miffed because the ice man didn’t stop at our house—we had an electric refrigerator. I was 10 when Israel became a state in 1948. I remember the joyfulness we celebrated in Hebrew school. Grand Rapids resettled survivors of the Holocaust, but they didn’t talk too much about their ordeal at that time, and the Holocaust didn’t yet have a name. Our orthodox shul, Ahavas Israel, joined the Conservative movement in 1947, and I was in the third bat mitzvah class in 1950. So many years…that went too fast. But I am happy to be an octogenarian and happy to share a few memories. My mother, Natalie Cooper, asked me to write as it was her 80th birthday on January 20th of this year. She wanted me to relay to you that she is a happy and healthy 80-year-old who loves her life, which includes seeing both of her adult children and her grandchildren often. Her hobbies include reading, watching TV and knitting, and she is very active. For her birthday, my sister and I took her to her favorite restaurant for breakfast followed by a day of shopping and then a late lunch/early dinner at her favorite pizza place. Life was always delicious milk chocolate, but since my husband’s death seven years ago, everything is bittersweet. When I turned 80 three years ago, my entire family threw me a special birthday party. I rejoiced with my children, grandchildren and great-grandkids. I thanked God for all that he has given me. I missed those no longer here. As I said, chocolate, albeit bittersweet. Marlene, I always loved your brilliant columns when you were president. I have been a life-member since the early 1990s when my husband and I volunteered in Netanya’s WIN program and I saw first-hand Hadassah’s work. 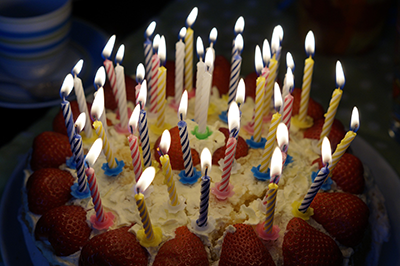 In reference to your article in Hadassah Magazine, titled “Personal Milestones,” we would like to share our story of six childhood friends celebrating our 80th birthdays together. Our lifelong friendships began at the age of 12 in Baltimore. We have celebrated major events together throughout the years, and in February 2018, we gathered in Florida to celebrate our special 80th young years! We look forward to being together once again in 2019! Yes, indeed it is a celebration to turn 80, which I will do on December 14. Even though it is 10 months away, I am already celebrating. And then I will get in two full years of the big number. I am a big believer in acknowledging all the future years. Obviously, the alternate is not acceptable. My mother was 80 when she passed away. So I anticipate beating my mother to the goal and yes, I bypassed my father long ago, but would you believe I have to go to 90 to beat my maternal grandmother? After nine kids and a life of supporting her family (her husband was a Torah student), she was one of the few in the family that made it to that ancient age. That is going to be my goal. I relish in my three grandchildren, particularly the oldest. His home has been near me for all his life but the future lies in Washington, D.C., with the anticipation of working in an area that supports Israel, whether for a private think tank or a position with a Congressperson or some other entity of value to Israel. I will miss seeing him every week but I am supporting his every effort. My other two younger grandchildren have good backing from their parents and my husband and I, but we don’t get to be with them much, since they don’t live nearby. For the big celebration we anticipate we will be altogether with the family. I know my daughter in law has been working on a commemorative video of all the years gone by. I am sure the grandchildren will prepare messages or a speech to be presented at our family gathering. My son will plan an amazing home cooked meal probably for Shabbat and my daughter will accompany us on the plane ride for the gathering. There are eight of us and family is everything. Life has its ups and downs but 80 is the milestone for anyone. We need to be positive and look forward to the future. Celebrating 80 is WOW. Mazel tov, Marlene, on your 80th! I’ll reach that milestone on December 11, but I still feel like a kid, mostly. When/if I get there, I’ll be happy I made it and grateful for the life I’ve had: two hard-working and loving parents, two wonderful sons, four grandchildren, great extended family and friends, a fulfilling teaching career, travel to over 100 countries and volunteer work that brings me joy. I’ll probably celebrate with my husband of 57 years as we did this Valentine’s Day—at Burger King devouring Whoppers. Thanks for all your Hadassah work. So you’re turning 80 this Year! Mazel tov! But what’s the big deal about 80? (Someone told me, “If what you say is true, you’re not bragging.”) I did that over six years ago and truth be told, my body is reminding me I’m not 80 anymore :). Like you, I’m still working.As a matter of fact, last year (my 86th) turned out to be one of the busiest years in terms of exhibiting my sculptures, including in Chartres, France, and London, England. Last year in March I exhibited at the National Art Club in NYC, at Art Expo in NYC, at the W Austin, Austin Texas, at Studio 80 Sculpture Park, Old Lyme, Conn, Kew Gardens, London,, Cedar Park, Texas. In April, I participated in a a three-panel group at the National Art Club in NYC, went to an art conference in Coral Gables in November and ended my year by exhibiting at Art Basel Miami/Spectrum in December. You asked us to be honest when we wrote to you. I’ll be honest, I’m thrilled I’m still making new sculptures and I feel satisfied that I was able to go to foreign cities to live and work while I exhibited my sculptures, which was my dream. My dream came true! I thought I’d have to keep changing my goal because at one time it was to have 25 sculptures on exhibit in public places. Last September, I did have 25 sculptures on exhibit because Kew Garden selected five works to be in their exhibit. That show ended October 16, so I’m back down to currently having 20 sculptures in public places internationally. So Marlene, you have a lot to look forward to It’s not necessary to look back for happy memories. You can enjoy your 80th and know there are many more to come that will be as filled with fun as the last 80! Maybe the best is yet to come for both of us! I loved to read them and mine was is one of them. I am in such good company looking forward to many years to come. My mom lived to be 97 and my dad 80. My grandparents into their 70’s and 80’s. I know I have longevity in my family and I will continue to enjoy my life by travelling and keeping myself involved for as long as I am able. After reading all of these beautiful posts, I know that 80 is going to be amazing and getting there will be a terrific ride! I’ll enjoy the next 25 years in the meantime.